My colleagues Christophe Pottier and Damian Evans spent years using a variety of techniques to create the first comprehensive map of the Angkorian urban heartland in Siem Reap. This map showed mounds, ponds, temples, rice fields, canals, dikes, and embankments — all modifications made by the people of Angkor within a 1000 square kilometer area. This map showed low-density urban landscape surrounding Angkor Wat, Angkor Thom and the other temple sites that most tourists visit. You can see the map and read about their work (for free) here. Of course this work was greatly expanded by the recent LIDAR survey over Angkor, which in many ways has transformed our understanding of the extent of the urban planning and use of space, showing even more detail. You can read more and download an article about the LIDAR work here. You can see also my previous discussions of this topic here. For many years a French-Khmer team has been working within the city of Angkor Thom to understand the urban space within the enclosed capital. This work has produced a map of Angkor Thom that was nearly identical to the map produced by LIDAR. Although this work has not been published very well, it has shown that the areas under the trees within Angkor Thom once housed a planned and organized city, with people living on mounds. You can read more about this work here, check out an article on this work and map of Angkor Thom in this issue of World Heritage, and download a free article (in French) here. There has been a long-standing research program on Phnom Kulen that has looked at both the temples and other areas of occupation within the city of Mahendraparvata. Previous coverage here, here, and here. The EFEO has also been undertaking research investigating the Acramas of Yasovarman I. You can read a bit more about this project here. My colleague Mitch Hendrickson has done extensive work looking at the Angkorian road networks that linked the urban core of Angkor with farther flung regions. These road networks were in many cases connecting the center with valuable resources on the peripheries. As part of the road networks there were also extensive rest houses built to aid travelers on their journey. Mitch has made several of his publications on this work available for free download on his Academia.edu page. A joint Thai-Khmer project has focused specifically on examining the road between Angkor, Cambodia and Phimai, Thailand. This region of what is now part of northeast Thailand was likely an important source of salt for the ancient Angkorians. You can check out the project’s website here. Related to this work is Mitch Hendrickson’s more recent work examining the temple of Preah Khan of Kampong Svay (PKKS) and its relationship to iron deposits, iron working, and an ethnic minority (Kuy) that is believed to have been producing most of the Iron. Again, Mitch’s Academia.edu page provides more information on this work. Several projects have looked at Angkorian craft workers. My colleague, Martin Polkinghorne, has been investigating bronze and stone sculpture workshops. Both workshops he has excavated were associated with royal power centers. You can read short articles on this work here and here. Angkorian ceramics, and especially the kilns, have been a long standing research interest by foreign and Cambodian scholars alike. Linking to all the articles and research on this topic would be too extensive for this post, so below are a few beginning resources. –APSARA Authority page on their research on kiln sites and ceramics. -The new Khmer Production and Exchange (KPX) project focused on characterizing and dating Khmer ceramics and kilns. -An entire issue of Udaya devoted to work on Khmer ceramics. -PDF downloads of research posters on Khmer ceramics by Chhay Rachna and others here and here. Although my project is the first research driven project to investigate households, my colleagues at INRAP (a preventative archaeology group funded by the French government) have found the remains of Angkorian houses in their project at the Siem Reap airport. 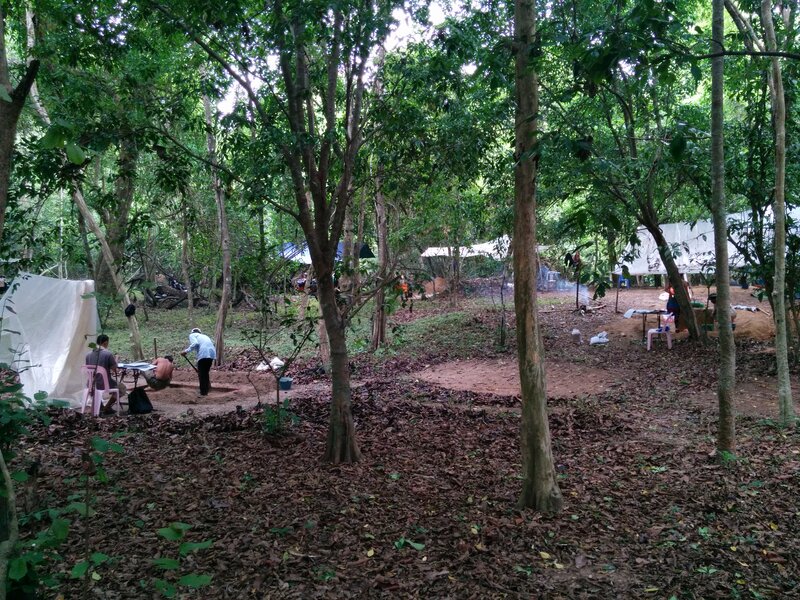 This work has not been well published yet, but their extensive excavations will provide valuable information on the residences of Angkorian people. Angkor’s massive population and extensive public works (temple construction, road building, and water management) could not have been supported without extensive rice reserves to feed its people. My colleague, Scott Hawken, has mapped and studied the planning of these ancient rice fields and has demonstrated that there is evidence for centralized and locally planned rice field systems. His work was recently published in Asian Perspectives. Have I left something out? Let me know in the comments. This entry was posted in Archaeology, Links. Bookmark the permalink. What about the study of astronomy and mathematics? Interesting topics for sure, but that is in the realm of history and epigraphy- not archaeology, so outside the scope of my expertise. So is there anybody studying khmer epigraphy? I’m not an expert but the ancient khmer people knowledge of the numerical number zero is very interesting in itself. Even though the zero that was found on the inscription of a 7th century stone tablet may not be the earliest known numerical zero, it still proves that ancient khmer people culture was much more advance than any other countries in the world including Europe at that time. Anyways, it’s an interesting topic to study maybe in the future. Perhaps a Cambodian inscription is one of the first to use the symbol 0, but people had been writing zero in different ways for hundreds of years. The zero symbol was included in a calendrical date- a calendrical system that was imported from India. Focusing on a misguided notion of who was more advanced than who (a nationalist and frankly racist idea) during a certain period actually doesn’t help us learn anymore about the ancient people we are trying to study. Well first of all I never said they invented the concept of zero. Frankly, it’s ok for tv shows to glorify european civilizations as the most advanced but it;s not ok for the other way around? I have no idea what TV shows you are talking about. This blog is not a TV show and TV shows are not an accurate barometer of what makes good research. They are about getting viewers and selling advertising . Really! I don’t really care about this blog is not a tv show am just pointing out western supremacist from stuff I’ve seen on such as the “History Channel” that the mentioned about Rome was the most advanced civilization and also Julius Caesar was the most powerfullest man in the world. I cringed. Like please!!!! The romans were great but I wouldn’t say the greatest civilization of all time. That’s just ignorant and plain racist.